Ryan Tannehill is not a great quarterback. Some would say he is not even a good one. One thing is certain. He’s the best option the Miami Dolphins have. Matt Moore was okay in relief of Tannehill last season after he went down with a knee injury. But he was clearly inadequate against the Steelers in the Wild Card game. The Dolphins need Tannehill. With him back under center, there is a reason for hope in Miami. That hope makes the knee injury he went down with in practice Thursday afternoon so heartbreaking. It was nothing unusual. Tannehill was trying to keep a play alive, so he scrambled out of the pocket and rolled out towards the sideline. As he neared the players, not in the drill, he appears to pull up right before hitting the ground. No one touched him. Something didn’t feel right to him, and he hit the dirt. 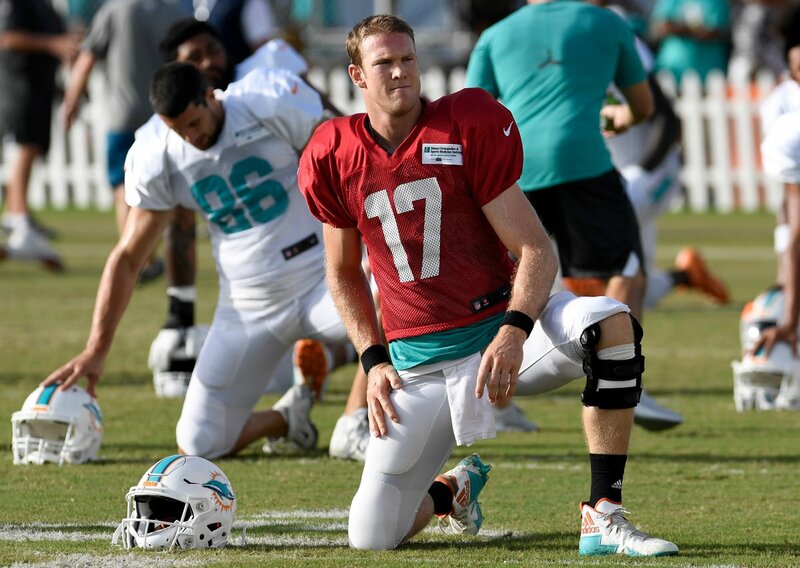 According to the Miami Herald’s Armando Salguero, Tannehill has hyperextended his left knee, the same one he injured towards the end of last season. The team fears he may have some damage to his posterior crucial ligament (PCL). A sprain wouldn’t necessarily require surgery, but it could knock him out for anywhere from two to eight weeks. Anytime a knee injury occurs, there is concern over the ACL, especially if it has been injured in the past like with Tannehill. A sprain or partial tear to the same area he injured last season would likely mean surgery and could quite possibly end his season. That would mean the Miami Dolphins will be jumping into the free agent quarterback pool. Matt Moore would likely get the nod for now, but the team will need someone with more actual experience than David Fales or Brandon Doughty. The usual suspects are already being named as possible targets, i.e. Colin Kaepernick and Robert Griffin III. Dolphins owner Stephen Ross expressed his support of Kaepernick’s protest last season. So, he would probably not care about any possible backlash that would accompany signing Kaepernick. Griffin supposedly looked pretty good during a workout with the Chargers recently and has been linked to the Ravens. Otherwise, there has been no significant interest in him. An interesting choice that has yet to get any attention online is a former teammate of Tannehill’s, Johnny Manziel (he redshirted in 2011, Tannehill’s senior season). Manziel has expressed an interest in making a comeback and has supposedly generated some interest from teams. But he has yet to be offered a workout with anyone. During his short career with the Browns, Manziel showed little to no promise and certainly none of the flashes that made him a household name in college. Now that he appears to have gotten past his personal demons can he get the magic back? Possibly—someone just has to give him a shot. Otherwise, the best option would be trying to lure Jay Cutler out of the broadcast booth and back to the sideline. 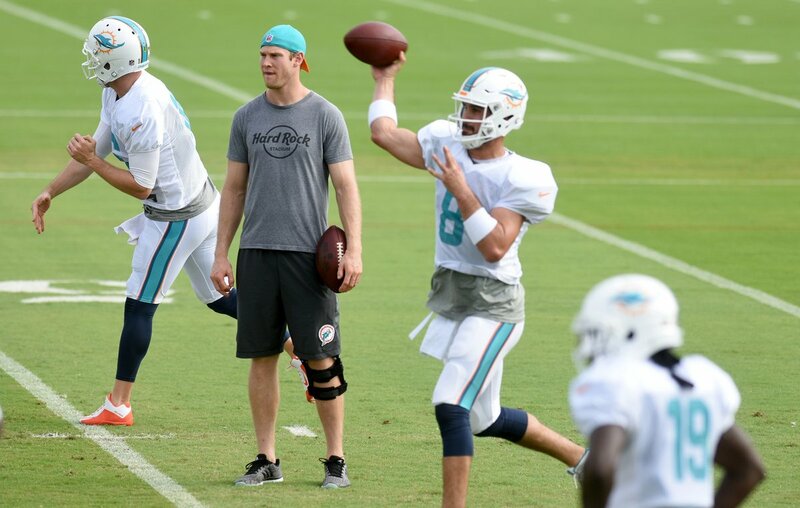 [UPDATE] The team has announced that there was no tear in Tannehill’s knee. But they have not commented on how long or if they will hold him out.